The Raspberry Pi Zero is a $5 computer designed by the nonprofit Raspberry Pi Foundation, and it’s one of the most developer-friendly compute chips of its kind. Google’s even endorsed it — the search giant’s recently announced AIY visual kit lets you turn a plain old Raspberry Pi Zero into an artificially intelligent platform that can perform image recognition. But one of the most impressive projects yet might just be the ZeroPhone, a do-it-yourself smartphone. 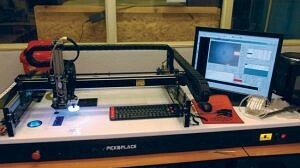 It’s the brainchild of 22-year-old Arsenijs Pičugins, who hails from Riga, Latvia, and it’s admittedly not the most attractive thing in the world — TechRadar, who interviewed Pičugins, described it as a “PCB Sandwich”. But Pičugins aims to keep the price below $100, and the ZeroPhone’s specs are pretty impressive for what you get. The hobbyist phone, which runs Raspbian Lite and ships with an open source UI development kit, rocks a 1.3-inch, 128 x 64 monochrome OLED screen with a Broadcom BCM2835 application processor clocked at 1GHz and 512MB DDR2 RAM. It has WiFi capabilities and 2G mobile data support (Pičugins says it’ll get a 3G modem down the line), and it charges via micro USB. It can output video via HDMI and audio via a 3.5mm headphone jack, and send and receive commands from any application written in Python. It’s not for the faint of heart, though. Pičugins says the ZeroPhone’s moderately difficult to assemble, and that it’s best attempted by people who a little familiar with soldering. But if that doesn’t intimidate you, it’s incredibly versatile — the ZeroPhone supports add-ons via the Raspberry Pi Zero’s GPIO expansion headers, and can do just about anything with a little elbow grease (Pičugins gave the example of being able to reprogram a laptop motherboard’s BIOS by desoldering it and connecting it to the ZeroPhone). 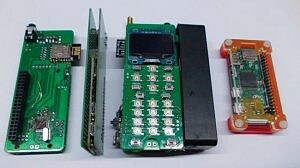 The ZeroPhone’s entering its first crowdfunding phase this week, and Pičugins hopes to offer an array of cases as backer rewards. If you’re interested in getting in on the ground floor, check out the interview at the source link.